The Empowered Learning Model shows how Franklin Covey products and services can be integrated for maximum impact through a powerful process of personal and organizational change. Individual and organizational performance can be affected by many factors - the design of work processes, the alignment of an organisation's strategy to the needs of the marketplace, the level of trust in the culture, the nature of the competition and so forth. 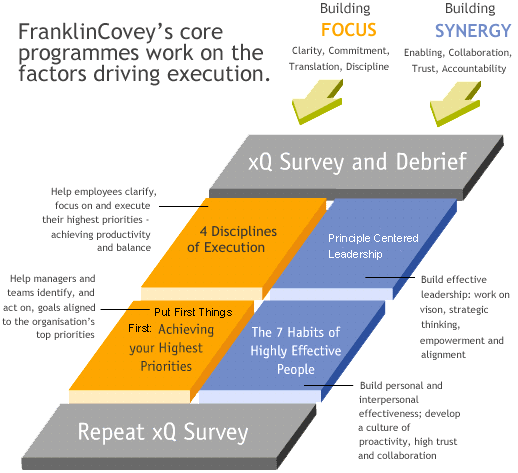 Franklin Covey has additional methodologies for work in these areas. The ELM compliments these offerings, but focuses primarily on increasing the effectiveness and performance capability of people. Are your People Focused on Top Priorities. How many of your employees are focused, energetically engaged, and delivering results every day? Can everyone-from the boardroom to the plant floor-identify your organization's highest priorities? Do they pull together effectively to maximize those results? Helps employees from top to bottom in your organization voluntarily and passionately focus and execute on your highest priorities. Helps leaders and employees achieve superb results by pulling together at the highest levels of effectiveness and teamwork.